This article is about profit in economics and political economy. For profit in accounting and business, see Profit (accounting). In economics, profit in the accounting sense of the excess of revenue over cost is the sum of two components: normal profit and economic profit. Normal profit is the profit that is necessary to just cover the opportunity costs of the owner-manager or of the firm's investors. In the absence of this profit, these parties would withdraw their time and funds from the firm and use them to better advantage elsewhere. In contrast, economic profit, sometimes called excess profit, is profit in excess of what is required to cover the opportunity costs. The enterprise component of normal profit is the profit that a business owner considers necessary to make running the business worth his or her while, i.e., it is comparable to the next-best amount the entrepreneur could earn doing another job. Particularly, if enterprise is not included as a factor of production, it can also be viewed as a return to capital for investors including the entrepreneur, equivalent to the return the capital owner could have expected (in a safe investment), plus compensation for risk. Normal profit varies both within and across industries; it is commensurate with the riskiness associated with each type of investment, as per the risk-return spectrum. Only normal profits arise in circumstances of perfect competition when long-run economic equilibrium is reached; there is no incentive for firms to either enter or leave the industry. Profits can be theorized by the phenomena of equilibrium or disequilibrium. These phenomena have the ability to retain its activity as static or dynamic. Economic variables such as effects of size, share or rate, or source of profits are determined by these theories. Economic profit does not occur in perfect competition in long run equilibrium; if it did, there would be an incentive for new firms to enter the industry, aided by a lack of barriers to entry until there was no longer any economic profit. As new firms enter the industry, they increase the supply of the product available in the market, and these new firms are forced to charge a lower price to entice consumers to buy the additional supply these new firms are supplying as the firms all compete for customers (see Monopoly Profit § Persistence). Incumbent firms within the industry face losing their existing customers to the new firms entering the industry, and are therefore forced to lower their prices to match the lower prices set by the new firms. New firms will continue to enter the industry until the price of the product is lowered to the point that it is the same as the average cost of producing the product, and all of the economic profit disappears. When this happens, economic agents outside of the industry find no advantage to forming new firms that enter into the industry, the supply of the product stops increasing, and the price charged for the product stabilizes, settling into an equilibrium. The same is likewise true of the long run equilibria of monopolistically competitive industries and, more generally, any market which is held to be contestable. Normally, a firm that introduces a differentiated product can initially secure a temporary market power for a short while (See Monopoly Profit § Persistence). At this stage, the initial price the consumer must pay for the product is high, and the demand for, as well as the availability of the product in the market, will be limited. In the long run, however, when the profitability of the product is well established, and because there are few barriers to entry, the number of firms that produce this product will increase until the available supply of the product eventually becomes relatively large, the price of the product shrinks down to the level of the average cost of producing the product. When this finally occurs, all monopoly profit associated with producing and selling the product disappears, and the initial monopoly turns into a competitive industry. In the case of contestable markets, the cycle is often ended with the departure of the former "hit and run" entrants to the market, returning the industry to its previous state, just with a lower price and no economic profit for the incumbent firms. 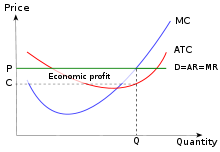 A monopolist can set a price in excess of costs, making an economic profit (shaded). The above picture shows a monopolist (only one firm in the industry/market) that obtains a (monopoly) economic profit. An oligopoly usually has "economic profit" also, but usually faces an industry/market with more than just one firm (they must share available demand at the market price). In a regulated industry, the government examines firms' marginal cost structure and allows them to charge a price that is no greater than this marginal cost. This does not necessarily ensure zero economic profit for the firm, but eliminates a monopoly profit. If a government feels it is impractical to have a competitive market – such as in the case of a natural monopoly – it will sometimes try to regulate the existing uncompetitive market by controlling the price firms charge for their product. For example, the old AT&T (regulated) monopoly, which existed before the courts ordered its breakup, had to get government approval to raise its prices. The government examined the monopoly's costs, and determined whether or not the monopoly should be able raise its price and if the government felt that the cost did not justify a higher price, it rejected the monopoly's application for a higher price. Though a regulated firm will not have an economic profit as large as it would in an unregulated situation, it can still make profits well above a competitive firm in a truly competitive market. The social profit from a firm's activities is the accounting profit plus or minus any externalities or consumer surpluses that occur in its activity. A firm may report relatively large monetary profits, but by creating negative externalities their social profit could be relatively small or negative. It is a standard economic assumption (though not necessarily a perfect one in the real world) that, other things being equal, a firm will attempt to maximize its profits. Given that profit is defined as the difference in total revenue and total cost, a firm achieves a maximum by operating at the point where the difference between the two is at its greatest. In markets which do not show interdependence, this point can either be found by looking at these two curves directly, or by finding and selecting the best of the points where the gradients of the two curves (marginal revenue and marginal cost respectively) are equal. In interdependent markets, game theory must be used to derive a profit maximising solution. Another significant factor for profit maximization is market fractionation. A company may sell goods in several regions or in several countries. Profit is maximized by treating each location as a separate market. Rather than matching supply and demand for the entire company the matching is done within each market. Each market has different competition, different supply constraints (like shipping) and different social factors. When the price of goods in each market area is set by each market then overall profit is maximized. ^ Hirshleifer et al., 2005. p. 160. Carbaugh, Robert J. (January 2006). Contemporary economics: an applications approach. Cengage Learning. ISBN 978-0-324-31461-8. Retrieved 3 October 2010. Mansfield, Edwin (1979). Micro-Economics Theory and Applications (3rd ed.). New York and London: W.W. Norton and Company. LeRoy Miller, Roger (1982). Intermediate Microeconomics Theory Issues Applications (3rd ed.). New York: McGraw-Hill. Tirole, Jean (1988). The Theory of Industrial Organization. Cambridge, Massachusetts: MIT Press. Black, John (2003). Oxford Dictionary of Economics. New York: Oxford University Press. Jack Hirshleifer; Amihai Glazer; David Hirshleifer (2005). Price theory and applications: decisions, markets, and information. Cambridge University Press. ISBN 978-0-521-81864-3. Retrieved 20 December 2010. Entrepreneurial Profit and Loss, Murray Rothbard's Man, Economy, and State, Chapter 8. Thurow, Lester C. (2008). "Profits". In David R. Henderson. Concise Encyclopedia of Economics (2nd ed.). Indianapolis: Library of Economics and Liberty. ISBN 978-0865976658. OCLC 237794267. This page was last edited on 8 April 2019, at 19:15 (UTC).